All the friends in the Olobob Forest come in all sorts of shapes and sizes and each and every one is important! Meet Gurdy, Lemon and Norbet, along with Crunch, Deeno, Groan Up and even the Snoofs, Scuttles and the Topsy Turvies! What Olobob friends will you make? Based on the hit CBeebies series, Olobob Top. This brilliant activity and sticker book welcomes little ones to become part of the amazing world of Olobob Top with engaging and colourful activities! Have fun helping all the Olobob friends - draw a picture of yourself on Lalloo's friendship wall, help Baby Snoof get back to the nest and get dressed for Deeno's disco party. Complete the pages with colourful stickers and create your very own Olobob characters! Olobob Top is the exciting CBeebies animated preschool TV series that follows Tib, Lalloo and Bobble. The Olobobs know that the right amount of imagination, inventiveness and creativity can solve anything. 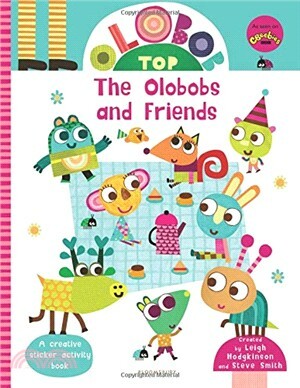 Bloomsbury's Olobob Top series allows children to extend and explore their own creativity, just like the Olobobs, whether it's by learning new shapes and numbers or creating their own imaginative world. Other titles available: Make Your Own Olobob Home, The Amazing World of Olobob Top, Let's Visit the Olobobs, Let's Visit Norbet's Shop, Let's Visit Big Fish's Pond.